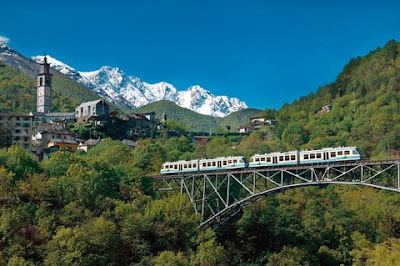 Take in Switzerland's stunning alpine scenery in a new five-day Top of Europe and Ticino rail package released by Rail Plus. The trip starts in Interlaken or Grindelwald in central Switzerland and includes an excursion to Jungfraujoch (3453m above sea level), a ride on the new scenic train Lotschberger from Spiez to Brig, and a journey on the Centovalli Railway through romantic landscapes. The trip finishes at Lugano, in the southern region of Ticino. The package includes hotels and breakfasts (two nights in either Interlaken or Grindelwald and two nights in Lugano), the rail journeys and transfers to and from any airport or Swiss Border. Prices are $800 per adult twin share for travelling Second Class and staying in three-star hotels or $870 for First Class while the four-star hotel option is $1000 and $1069 respectively. Child fares are from $342 (three-star hotels) and $477 (four-star hotels). The package operates all year but there is a $100 per person supplement for the winter season until April 10. Prices do not include seat reservations (about $30 per sector) or a $38 booking fee.